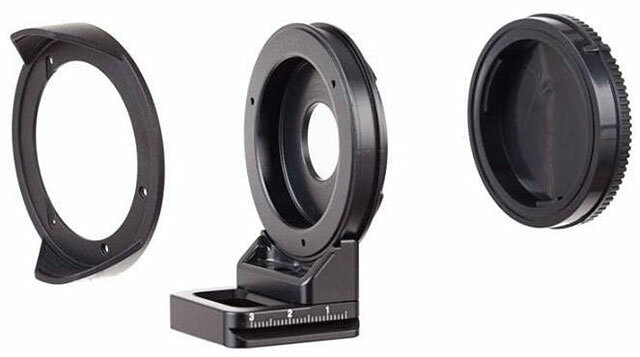 Mount your Samyang 7.5mm lens to a Fujifilm X-Mount Camera with this conversion kit. Settings for Samyang 7.5mm Fujifilm X-Mount converted on Nodal Ninja UR1 pano head. Settings for Samyang 7.5mm Fujifilm X-Mount converted on Nodal Ninja UR10 pano head. Note: in order to use this NPP setting, a new QRC-30 is needed for UR10. * The replacement mount allows the lens foot to be installed at positions so that the camera sensor is either portrait, landscape or with diagonal aligned vertically. Important: Issue of using the X-mount conversion kit on UR1 and UR10. Current Fujifilm X-series camera bodies are very tall at the left side of lens. They prevent the lens plate to be set at the NPP for regular UR10, and UR1 beyond 5 deg tilt. Either a much taller foot or a new shorter QR clamp for UR10 is needed to overcome this issue. The tall foot may be too bulky for many people and contradicts the aim for a more compact setup. A shorter QR clamp (QRC-30) has been made to solve this issue for R10. During purchase of a new UR10, customers can ask for swap of the stock UR10 QRC-35 with QRC-30. 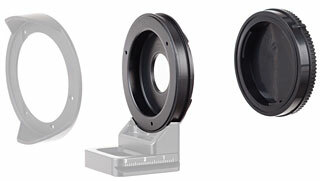 Existing UR10 users can purchase a QRC-30 from our accessories section. For UR1, it is limited up to 5 deg tilt which is enough to give good overlap at the zenith.